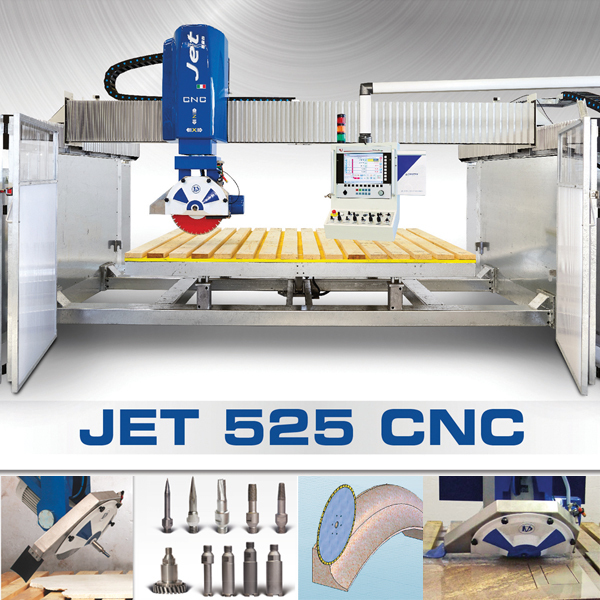 Numerical control cutting center with 5 interpolated axes for cutting slabs of natural and artificial stone. Machine with disk head swiveling from -5 to +365º and reclining from 0 to 90º. Movements may be interpolated with the other 3 machine axes (bridge, carriage, disk lift/lowering). Can be equipped with a diamond-studded disk with minimum 350 to maximum 525 mm diameters. The “TOOLS” version (optional), can mount diamond-studded tools such as: end mill, digging wheel, horizontal disk to perform a variety of work processes. Fixed no-rotation slab bench with rocking slab support table (optional) to make it easy to load the slab.